“One dollar a day. 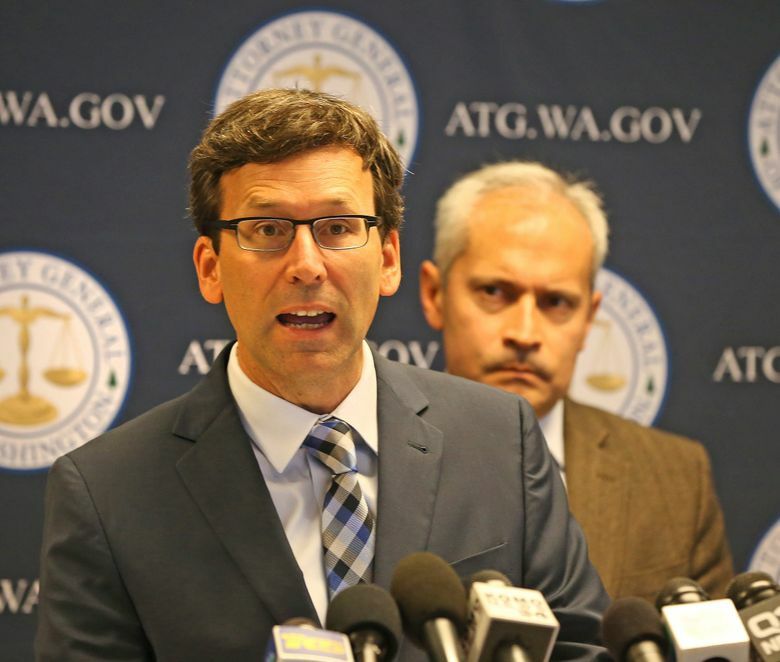 Give me a break,” said State Attorney General Bob Ferguson, who filed suit against the country’s fourth-largest detention center, in Tacoma. That’s the amount detainees are paid to work — a violation of the state’s minimum-wage law, Ferguson charges. Furthering his reputation as a crusader on immigration issues, state Attorney General Bob Ferguson is taking on the multibillion-dollar corporation that runs the country’s fourth-largest detention center, located in Tacoma. Ferguson filed a lawsuit Wednesday against The GEO Group, which operates the Northwest Detention Center and about 140 other such facilities nationwide. The suit, filed in Pierce County Superior Court, accuses GEO of violating state minimum-wage law by paying detainees $1 a day — or sometimes just chips and candy — to work at the detention center. GEO projected in 2015 that its Tacoma facility would take in $57 million in revenues annually at full capacity, around 1,575 people. Nationally, the company earned more than $2 billion in 2016. Yet the Florida-based company uses detainee labor to perform virtually all work at the detention center besides security, according to Ferguson. That includes preparing meals, doing laundry and cleaning common areas and restrooms. “GEO strongly refutes the baseless and meritless allegations made in this lawsuit, and we intend to vigorously defend our company against these claims,” said the company in a statement. The statement called detainee labor a “voluntary work program” — a notion Ferguson’s lawsuit does not dispute, although an attorney in his office said some detainees indicated they felt compelled to work. Immigrants in Colorado filed a class-action suit this year saying they were forced to work in a facility there. GEO’s statement also said its wage rates follow standards set “exclusively” by the federal government. That might mean that GEO plans to challenge the state’s authority. Pablo Paez, GEO’s vice president for corporate relations, declined to elaborate. Ferguson’s office said GEO’s contract with the feds requires it to follow state and local laws. Those include abiding by Washington’s minimum wage: currently $11 an hour and $7.35 an hour in 2005, when GEO got its first contract for operating the Tacoma facility. State law allows certain exemptions, including for government-run prisons and jails. Privately run facilities are not exempt, however, Ferguson said. What’s more, he stressed, the Northwest Detention Center is not a criminal correctional facility; detainees held there are going through civil immigration proceedings. GEO’s payment to detainees is “not even close” to what it should be, said the attorney general, who has filed previous lawsuits over the Deferred Action for Childhood Arrivals (DACA) program and President Donald Trump’s travel ban. “One dollar a day. Give me a break,” Ferguson said. His lawsuit is asking for GEO to relinquish all the money it should have paid to detainees had it abided by the state’s minimum wage. “We are very excited about this action,” said Jorge Barón, executive director of the Northwest Immigrant Rights Project (NWIRP), speaking at Ferguson’s news conference. He said the attorney general was doing what the feds never have: holding GEO accountable. Barón noted that the Northwest Detention Center has repeatedly come under criticism. Detainees have launched a series of hunger strikes, dating to at least 2014, complaining of the $1-a-day work policy as well as inadequate food, poor medical care and mistreatment by guards. A group called the Northwest Detention Center Resistance called Ferguson’s lawsuit a victory for hunger strikers. Tacoma City Council seemed to agree in March when it passed an emergency ordinance that would have rejected possible expansion plans submitted by GEO and banned new such facilities in Tacoma. But the city scaled back the ordinance amid questions over the ordinance’s legality and arguments, including by some immigrant advocates, that arrested immigrants would just be sent to other facilities farther from their families. Ferguson did not touch that issue. All he wanted, he said when asked, was for GEO to follow the law.